The UN Permanent Court of Arbitration in The Hague against China’s claims to economic rights in a massive area of the South China Sea, in particular the disagreement between the Republic of the Philippines and the People’s Republic of China concerning the latter’s massive “nine-dash line” historical claim that all but eats up the archipelago nation’s mandated 200-nautical mile exclusive economic zone laid out in the UN Convention on the Law of the Sea (UNCLOS). The Guardian reports that the Court’s final resolution on the disputed territory sheds doubts on China’s South China Sea gains as a whole, and in the worst case scenario push the Asian superpower into a potentially violent reaction owing to the tribunal’s unilateral arbitration. The extent of territorial boundaries in the South China Sea has long been a diplomatic headache and military powder-keg for the nations of East and Southeast Asia. 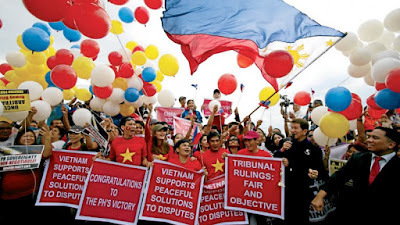 The People’s Republic, the Philippines, Vietnam, Brunei, Malaysia, Japan, and even Taiwan of its own right outside Beijing have staked claims in it. None however are more extensive than that of China, with its sweeping area overlapping with most of the other claims especially those of the Philippines, but which it insists are traditional territorial waters of the early Chinese Imperial Dynasties as far back as 2,000 years ago and therefore supersedes any recent contemporary international laws and agreements such as UNCLOS. Tensions have gotten to a point that the United States has gotten involved in some capacity,expressing support for other nations whose claims are within the Chinese “nine-dash line” especially that of its former colony and close ally the Philippines. American naval patrols have braved the waters within the line, much to China’s consternation and threats of aggressive reactionary measures. Already the People’s Liberation Army Navy has missile destroyers and frigates on watch for what Beijing labels “further US infringement on Chinese sovereignty”. It does not recognize the tribunal’s authority and swears not to abide by its judgment. 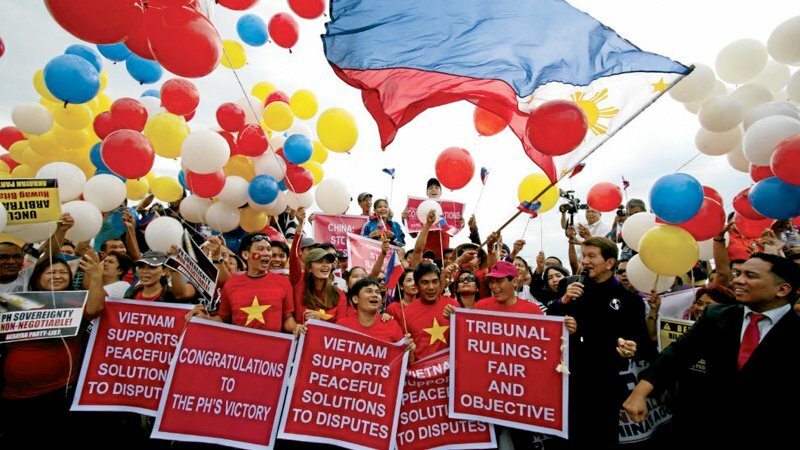 The Philippines, primary complainant of the 2013 case presented before the Court of Arbitration, has passively pushed back against Chinese gains in its exclusive economic zone, officially referring to the South China Sea as the West Philippine Sea, and counting on support from both the US and Japan – former colonizer and WWII conqueror respectively – in preparing its defense capabilities in case of the worst case scenario, with their joint military exercises and permission to land American military planes on its bases. Despite everyone in the region on tenterhooks after the Court’s verdict, with concerns over China’s response since things do not go its way, political analysts the world over are of the opinion that the Communist economic superpower will instead adapt a happy medium approach, neither accepting the Court’s authority nor actually going on a war footing over an unfavorable decision. The fact that China is set to host the G20 Summit in September may have something to do with its restraint.